Apple today updated its investor relations page to note that it will announce its earnings for the fourth fiscal quarter (third calendar quarter) of 2016 on Thursday, October 27. The earnings report will be an exciting one, as it will provide a look at early iPhone 7 and iPhone 7 Plus sales. Apple has declined to release launch weekend sales for the two devices, making it difficult to determine how well the new phones have sold compared to the iPhone 6s and 6s Plus. For the third quarter of 2016, Apple posted revenue of $42.5 billion and net quarterly profit of $7.8 billion, or $1.42 per diluted share. That was down from $49.6 billion in revenue, $10.7 billion in net quarterly profit, and $1.85 per diluted share in the year-ago quarter. Apple's guidance for the fourth quarter of fiscal 2016 includes expected revenue of $45.5 to $47.5 billion and gross margin between 37.5 and 38 percent, well below the revenue of $51.5 billion it saw in 4Q 2015. Apple will release its quarterly earnings statement at 1:30 p.m. Pacific Time (4:30 p.m. Eastern Time), with a conference call to follow at 2:00 p.m. Pacific Time (5:00 pm. Eastern Time). 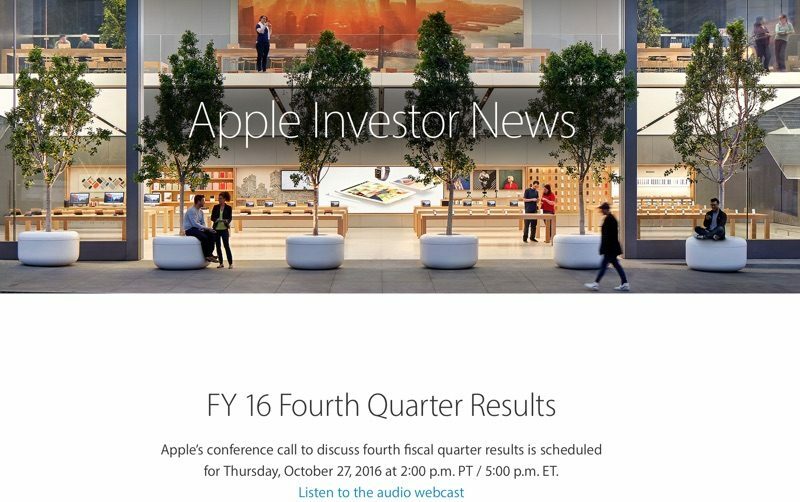 MacRumors will provide live coverage of the results and the call. You can't comment on actual sales numbers but find you've received great enthusiasm from your customers and they love the iphone 7. This is Apple's speciality now, profit reporting, not making great products but selling any product. Case in point, look at the sheer number of variations you can have Apple products in. Also added a 256gb option and we'll overcharge for this. Simply because you cannot have the option to put in a £20 SD card. The iPad line up is just as convuluted. Meanwhile the Mac lineup dwindles into the abyss. And what do you think the profits represent, if not a representation of Apple making great products and consumers being willing to shell out the premium for them? I think it's a good assumption Apple will release all their new products before earnings. So, if earnings is 10/27, then an event 10/24 is out of the question because it's too close (also, its a Monday). We could have one 10/4, but that's highly doubtful given we've passed the invite range. More likely is 10/12 (a Wednesday because of Columbus Day holiday in the US), or 10/18. If 10/18, and if it follows iPhone pre-order dates, we would have pre-orders on 10/21 for release on 10/28... one day after the earnings event. So I'm putting my money on a 10/12 event. I know it's a lot of assumptions, but that's my guess and I'll stick to it until next week when/if it's proven wrong. If you find yourself twiddling your thumbs, have a skim through some of the comments from the 'similar threads' at the bottom of this page. You may be surprised how little the doom and gloom has changed from one quarterly report to the other. Who else here thinks that Apple should do the earnings reports like the they do the product announcements. Hello everyone! I am so excited to tell you about this quarter's earnings. Our EPS are up (shows $1.45/share as a huge bar), and so are our earnings compared to 1999! And to conclude, for those in the room, there are some samples of the money that we earned. Take no more than two of them! Enjoy! "And now for the question and answer session. Please keep your questions to one, and one follow up. We have Jim Cramer from CNBC on"
It represents quantity sales. McDonald's sells lord knows how many burgers a day, do you consider it to be gourmet dining? Apple is trying to sell the same product in different iterations. New colours, new storage options or small tweaks, etc. It's not good enough. Mac Donald's moves tons of burgers every day because of their comparatively low prices. Apple sells a ton of hardware despite the premium pricing that they command over the rest of the competition. So Apple has both quality and quantity on their side.